As I write this article I am lying next to a window overlooking the river Spree in Berlin. It is late evening, and the reflections of the city lights are dancing across the surface of the rippling black water, creating a rather magical atmosphere. It’s Wednesday night now, and we left Stockholm early on Monday morning, taking the train to Copenhagen, where we stayed in the train station for a grand total of 20 minutes, before departing on the train to Hamburg. From there we took a third train to Berlin, arriving at about 9pm (a grand total of ten and a half hours of travel!). It was pouring with rain when we arrived, quite a shock after the sunny weather in Stockholm, but the city looks incredibly beautiful in the rain, particularly at night. We came straight over to our hostel, which is comprised of two boats moored in the river Spree right next to the remnants of the Berlin Wall. Never having left Australia, I didn’t know what to expect from major European cities – and it has been quite a learning experience! To start with, Berlin is colossal. We walked for about five hours straight on Tuesday and covered less than a quarter of the city. But more than the vast spread of the city, everything in it is huge – I’ve never even seen buildings this size in real life before. There is street art absolutely everywhere, which lends a vibrancy to the tone of the place. But there is also something about the city that you just can’t put your finger on, something grim, and stark, due to the extreme political history of the place. It has a bizarre vibe to it. It’s a place that has been central to some of the most important social and political events of the last century, and it is as if these events have left their fingerprints all over the city. It isn’t just the physical marks, like the war memorials, but something far more intangible – there’s a gritty kind of realism about the place, completely foreign to anywhere in Australia. But we haven’t spent the entire time in sombre contemplation – many litres of German beer have been consumed, along with several cocktails, and lots of delicious food (a tip: currywurst seems like a good idea but don’t try it if you don’t want to spend the next few hours in the bathroom!). I achieved one of my life goals which was to visit the grave of Bertolt Brecht, one of my biggest heroes. We also visited the apartment (now a museum) where he lived out his last years, post-exile. It’s the closest I have come to having a “fan girl” experience in a long time. I also saw the Reichstag, the Brandenburg Gate, the victory column, the holocaust memorial, the Cathedral – the list goes on! The cultural differences between Germans and Australians are small enough that I haven’t particularly felt any sense of culture shock, although this morning after showering we reported back that we had both been surprised to each see a stranger nonchalantly strip completely naked in front of us – then this evening we realised that they were the middle aged couple we had just been chatting to on the deck! A very giggly moment. The language barrier has not been a problem at all, and everything has been almost too easy, despite the fact that Berlin is famous for unfriendly customer service! But even when people speak to you in German and you don’t understand a word, things still tend to inexplicably turn out ok. And even better, through sunburn, stress, diarrhoea, nausea, blisters, weird rashes, and spending pretty much every minute of every day together (often in very cramped conditions), our relationship is still dreamy. We haven’t argued about anything – we’ve snapped at each other a bit (well, I’ve snapped and he has snapped back), but really we are incredibly well matched and in sync. I get stressed out easily but Jakob is (almost) endlessly patient and caring and gentle with me. He says he loves me even after I’ve been burping beer and curry all night and speaking in graphic terms about the current state of my bowels – he’s my ideal man, really. But, I digress. Tonight is our last night in Berlin and tomorrow we get the train to Warsaw, where we will be staying at a hostel that boasts a bar with the cheapest beer in the city (the dream!). I will remember Berlin fondly, but also as the strangest place I’ve ever been – a place trying to move on with modern life but forever living with the shadows of its past, where there is a giant statue of Marx and Engels in a park, where everyone drinks in the streets and where Jakob and I took our first ever trip together. This post is the second in a six part series we’ll be featuring on Lip. 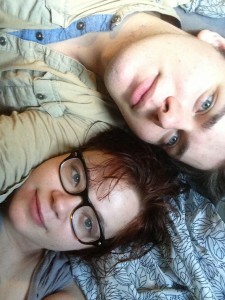 You can keep up to date with Kahtia and Jakob’s relationship as they adjust to living together via their video blog. You can also purchase Kahtia’s first novel, The Letter here. Have you been travelling with a partner? Worst/best moments? This entry was posted in Culture, Life and tagged berlin, dating, do long distance relationships work?, Kahtia Lontis, long-distance, love, men, online relationships, relationships, travel, women. Bookmark the permalink.